This is precisely what is at stake now for Yellowstone as the National Park Service approaches its centennial. The challenge rests not with the Park Service itself, which has earmarked more than $2 million for worthy restoration projects, but in two related outside threats. First, a Canadian mining company with an ominous name, Lucky Minerals, has proposed exploratory drilling for gold in Emigrant Gulch and on Emigrant Peak, in tributary drainages of the Yellowstone River just 30 miles north of the Yellowstone Park boundary. The local Park County Environmental Council and the larger regional group, the Greater Yellowstone Coalition, have investigated papers filed by the mining company with Montana’s Department of Environmental Quality and the U.S. Forest Service. The groups’ research unveils an ambitious scheme that includes the amassing of dozens of new mining claims, purchase of private patented claims in the area and a proposal for a mine occupying 2,500 acres (or the equivalent in land of 7,500 suburban houses). 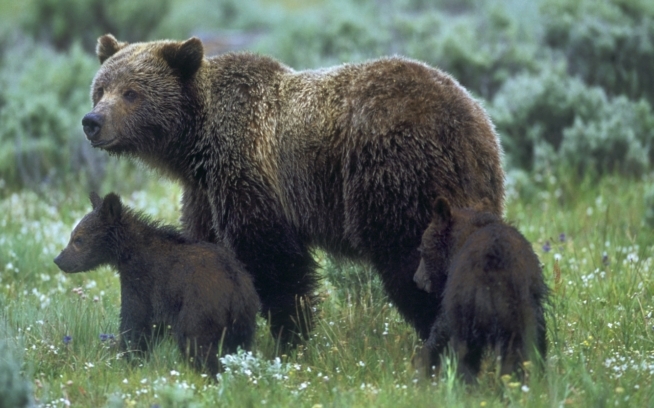 Meanwhile, the Fish and Wildlife Service (FWS) is making its second attempt in a decade to delist the Yellowstone grizzly as an endangered species. The reasons given—we’ll outline those below—don’t pass the political smell test. So far, major regional and national environmental players have not yet mobilized to take effective action, even though delisting would remove a major obstacle in the path of Lucky Minerals and the proposed Emigrant mine. The majority of public comments sent so far to the U.S. Forest Service and Montana Department of Environmental Quality in response to Lucky Minerals’ mineral exploration argue that the presence of the endangered Yellowstone grizzly and the invasion of its critical habitat are grounds to stop Lucky’s scheme. The Paradise Valley community appears willing to go to bat for the bear. As of now, though, it is Native Americans who have united and taken the strongest action. These tribes flourished in Yellowstone’s high country for thousands of years before European explorers and settlers arrived. Their descendants still see grizzly bears as relatives, healers and guides. To them, killing grizzly bears as trophies and mounting their heads is sacrilegious and deeply disturbing. In an unprecedented co-operative effort, 35 tribes have passed formal resolutions to oppose delisting. At the center of this effort is Guardians of Our Ancestors Legacy (GOAL). In September, tribal leaders will make their case personally to Secretary of the Interior Sally Jewell, asking her to intervene with Fish and Wildlife, which failed, contrary to law, to consult with the tribes before recommending delisting. We add our voice to that of the tribes and we hope you will too—for the sake of the grizzly itself, and to protect its much-needed habitat from threats that include the mine. Here’s the case made for delisting: Since passage of the Endangered Species Act, the grizzly population in Yellowstone has risen from as few as 150 to perhaps more than 700; that grizzlies in the Yellowstone region have therefore recovered; and that the local states (Idaho, Montana, Wyoming) should be free to issue hunting licenses to prevent the population from exceeding carrying capacity. We take issue with this decision on several grounds. Though an increase in bear population from 150 to 700 is impressive as a percentage, the current census, spread over several hundred square miles, represents a contingent, not a triumphant, success. The population is no longer growing and most likely declining. Connectivity remains a problem; Yellowstone’s grizzlies remain isolated from their cousins in Glacier, a few hundred miles to the north. 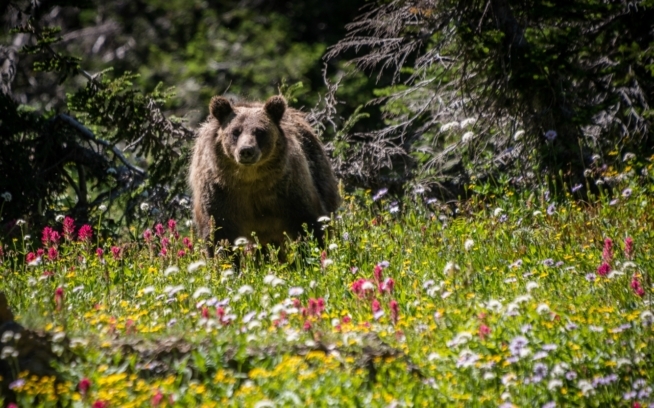 Until grizzlies have the corridors they need to ensure their genetic health, in the opinion of many wildlife biologists, they remain endangered. Moreover, grizzly habitat is vulnerable to the effects of accelerating climatic change, which hasn’t been fully assessed. In response to loss of whitebark pine, grizzly bears are turning more to meat, particularly elk and livestock, with often deadly consequences from run-ins with elk hunters and ranchers. This is not the time to delist any endangered animal in the region, let alone an indicator species like the grizzly, which has the lowest reproductive rate of any land mammal in North America. And there is the politics. The federal government provides stricter protections for wildlife than do the states of Idaho, Montana or Wyoming. Delisting grizzlies takes the feds out of the picture and hands the regulatory power to the states, whose laws are not as strong as they need to be—and where pressure is strong from legislators and private interests to enforce them lightly. Allowing a grizzly bear sport hunt, which the states aim to do, will exacerbate the problem of excessive mortalities that could push the population back to the brink of extinction. Interaction between humans and bears will continue to be a sensitive issue. Much more can be done to reduce conflicts with big game hunters and ranchers. We published an article several years ago by Ted Kerasote about a third-generation Montana rancher whose father once routinely killed grizzlies on his property. His dying wish was that his son let the grizzlies—starting then to make their comeback—live in peace on their land. And the son made it happen by changing a few practices: breeding the herd earlier in the year, so the calves would be stronger when they reached their summer pasture practices; by working with Montana wildlife managers to distribute cow carcasses to the ranches’ perimeter. He also bred fewer head of cattle but allowed them to reach greater weight. He earned the same profit on 300 head as another rancher would make on 600, with lower expenses and less environmental impact. These are wise practices that if widely adopted would help grizzlies and humans co-exist, but they are not now widespread. Meanwhile, an old regional cultural myth has taken even deeper root, that grizzlies can’t stay where humans live and work. This is rarely spoken aloud, but is the source of much of the pressure exerted by the states on Fish and Wildlife to delist. To let the grizzlies live and thrive is possible, even in a time of difficult climate transition. It is also necessary. That’s the consensus of the 35 native western tribes who oppose delisting. And we agree. Issuing licenses to hunt grizzlies as trophies is not a solution for our time. It is long past overdue to restore corridors to give grizzlies safe passage to roam and reduce their isolation. It’s necessary to keep a careful eye on the effects on all wildlife of the climate changes now in early but unmistakable stages in the northern West. Big environmental groups, take note. Fight the Emigrant Gulch mine but also defend the grizzly, whose legitimate listing as an endangered species can help in the fight to prevent the drilling, subsequent development and pollution of the Yellowstone River. Take the lead from the tribes, whose power is in their moral clarity, the solidarity of conviction and their good nose for bad politics. They don’t like the smell wafting from this decision. Neither do we. Add your voice to the growing movement on these two important issues. Step 1: Visit Park County Environmental Council and submit a comment to stop drilling in Emigrant Gulch before August 20, 2015. Together we can help ensure that when the Park Service turns 100 next year Yellowstone remains a thriving ecosystem worthy of being the first national park in history.